Asustek Computer is extending its Zenbook family of ultrabooks with a new model with a cover made from Gorilla Glass to make it resistant to scratches. The 13.3-inch Zenbook will go on sale in the third quarter with a choice of Windows 8 or the upcoming Windows 8.1, known as Windows Blue, said an Asus spokesman at the Computex trade show in Taipei, where the new Zenbook was on display. Along with the cover, the track pad and surrounding palm-rest are also made from Corning's Gorilla Glass 3, but with a brushed finish so they appear matt in color. The underside remains metal, which was necessary to give it enough structural support, the spokesman said. The glass is intended to make the product more elegant as well as more resistant to marks. It's just one way PC makers are trying to differentiate products and appeal to buyers, many of whom are favoring smartphones and tablets over laptops. Acer is also offering laptops with Gorilla Glass lids. Asus didn't give many other specifications for the new Zenbook. It has a backlit keyboard and will be offered with an Intel Core i5 or 28-watt dual-core Core i7 "Haswell" processor, the spokesman said. Despite the glass exterior, it will be slightly lighter than the current 13.3-inch Zenbook, which weighs 1.45kg, the spokesman said. It will also be a bit thinner, at around 14mm at the thickest point, versus 18mm for the current Zenbook. It will have a touch-panel, WQHD display at 2500x1600 resolution. 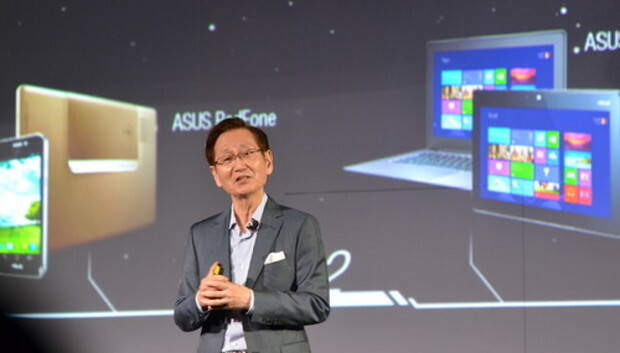 The Zenbook attracted a scrum of reporters outside the Asus news conference, but it wasn't featured by Chairman Jonney Shih during the event. Shih showed a new 7-inch Memo Pad Android tablet that will be priced at $149, or $129 in emerging markets, and a new three-in-one tablet/laptop/desktop device called the Transformer Book Trio.